The Qualitative Reasoning and Modelling (QRM) portal provides software tools (Garp3), documentation and support for users to build and simulate qualitative models. Qualitative	Reasoning (QR) is an area of research within Artificial Intelligence (AI) that automates reasoning and problem solving about the (physical) world. It creates non-numerical descriptions of systems and their behaviour, preserving important behavioural properties and qualitative distinctions. Successful application areas include autonomous spacecraft support, failure analysis and on-board diagnosis of vehicle systems, automated generation of control software for photocopiers, conceptual knowledge capture in ecology, and intelligent aids for human learning (Bredeweg & Struss, 2003). Qualitative Reasoning has particularly value for developing, strengthening and further improving education and training on topics dealing with systems and their behaviour. The goal of this QRM portal is to provide tools, methods and communication facilities to support such activities. Particularly the Garp3 workbench is being developed to support users in articulating, simulating and inspecting their conceptual knowledge of system's behaviour. See Software for the latest version of Garp3. Bredeweg, B., Linnebank, F., Bouwer, A., and Liem, J., 2009. 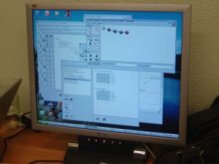 Garp3 - Workbench for Qualitative Modelling and Simulation. Ecological Informatics 4(5-6), 263-281. Bredeweg, B., Salles, P., 2009. Mediating conceptual knowledge using qualitative reasoning. In: Jrgensen, S.V., Chon, T-S., Recknagel, F.A. (Eds. ), Handbook of Ecological Modelling and Informatics. Wit Press, Southampton, UK, pp. 351-398. Users in action with the Garp3 workbench.